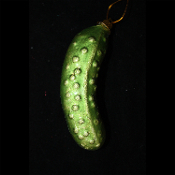 Start your own family event custom with this wonderful traditional pickle ornament! This item is made of dense gloss coated styro-foam, NOT GLASS... So safe for family events with no fear of breakage!!! Each foam pickle measures approx. 4-1/4-inch (10.76cm) long x 1-1/2-inch (3.81cm) wide x 1-3/8-inch (3.49cm) deep, and is sprinkled with metallic gold color glitter. Legend below is printed on front of package, as pictured. Makes a Great Gift! It's Christmas, a time of jingle bells, stockings, presents under the tree and family traditions. Celebrate the holidays with a time-honored, German-style ritual customary myth, and have fun with your family and friends for years to come! According to folklore, on Christmas morning, the first family member to spot the pickle was rewarded with a special *blessing (or special *prize) for the coming year, and received the first present from under the tree.